I’m not sure why I’m suddenly drawn to darker books. Starting with Frankenstein, moving to Graveminder (disappointingly un-dark just with semi-dark themes) and the Heart-shaped Box by Stephen King’s son, Joe Hill. Written by Melissa Mar, writer of the Wicked Lovely YA series, the book is her first foray into adult literature. 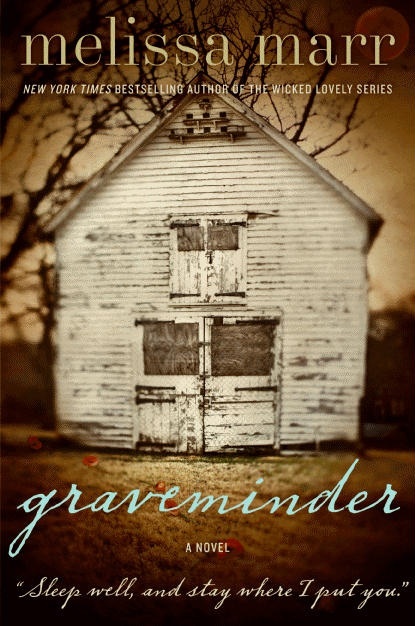 Although I did like some of the Wicked Lovely books, my favorite being Ink Exchange, I found The Graveminder lacking in both adult themes and…well… darkness. It reads exactly like a YA book, only with late 20-something adult characters. The characters acted like sulky teenagers. Over and over again, Byron (yes that’s his name) would declare his undying love for Rebekkah(yup), the girl who seems to stubbornly cling to the notion that it’s wrong to love her dead stepsister’s boyfriend because she feels guilty although they’ve boinked a lot of times before. I do love how Melissa Mar’s pacing moved the story forward. If I ever write my own book, I’d copy her style of breaking chapters into bite sized pieces. There were barely 2 pages per chapter. I actually read the book in two days while still doing other stuff. I wanted to like the book but… The mythology could have been explored more and I wished, Marr didn’t shy away from darker and more gruesome scenes. As an adult book, I expected more, instead I think it barely scratched the surface. But I heard this is going to be a series. I’m not sure I’d buy the next book in retail but I’ll probably look out for it in my next book bargain hunt. All in all, it’s an easy, fast-paced but bland read. I got my hardbound book on sale and promptly dropped it in flood waters. I got left with moldy and curled up pages which made it even bulkier than before. I could’ve read a more portable book but I felt compelled to read this one. The book felt like a traditional ghost story to me. It’s about a 50-something goth rocker who bought a soul from an online auction. I found the rocker a bit cliche but there are some twists to the story that are unexpected but not original. Not to say that I didn’t enjoy inhabiting Judas Coyne’s world for a while. I don’t think I’ll be re-reading this though. It didn’t give me any nightmares or anything but it’s not a world I would want to revisit any time soon. Having said that, I’m interested in other Joe Hill books. I like his uncluttered approach to description and believable dialogue. But I didn’t like his characters so much. Somehow they lack a certain spark that makes them entirely believable humans. For example is Craddock, the ghost. There’s not one redeeming quality about the guy. He’s a plain old villain through and through. Marybeth and Anna are typical groupies. And the rockstar is just a typical rockstar you can buy off-the shelf. I did like that I know most of the musical references Joe Hill included in the book. I’m not sure how exactly this relates to my favorite Nirvana’s song of the same title. Kurt Cobain was mentioned in passing just like the other references and another song was mentioned. I heard that this was going to be turned into a movie but I don’t think it pushed through as the director dropped out in ’08.